Successfully transitioning your team to an eRegulatory solution, while avoiding costly compliance mistakes and realizing true time-saving benefits, requires careful evaluation of potential platforms. After helping thousands of research teams implement eRegulatory, our team has put together these ten essential capabilities to look for when evaluating solutions. You can download our full Guide to Selecting and Evaluating eRegulatory Solutions here. Advanced project management is one of the primary benefits of an eRegulatory platform. Automating tasks and project workstreams reduce document cycle times by as much as 40% – saving your team time and accelerating your trials. Eliminating paper is one of the first benefits clinical trial teams gain when moving to a purpose-built eRegulatory system. Not only does eliminating paper contribute to accelerated study cycle times, but it also frees up space in offices used by active and archived studies. 21 CFR Part 11 compliant – Audit trail that tracks binder, folder, document and team activities such as – creation, deletion, viewing, name changes, move or duplication, download, signatures, team members added or removed, roles created and assigned, as well as due and expiration dates set. ICH GCP R2 compliant – Advanced dashboards and reporting functionality to meet oversight requirements. Learn more about 21 CFR Part 11 compliance, and ICH GCP R2 compliance. Selecting the right system is only half the equation, migrating all of your workflows and users to the new processes requires a true partnership between you and your vendor. No one wants to sign a contract and still be waiting for implementation a year later! Vendor SOPs that ensure changes to the system are documented in accordance with approved change control procedures. A library of feature and role-specific training videos, ticketing, knowledge database, request a new feature, etc. Download the Guide to Selecting and Evaluating eRegulatory Systems. 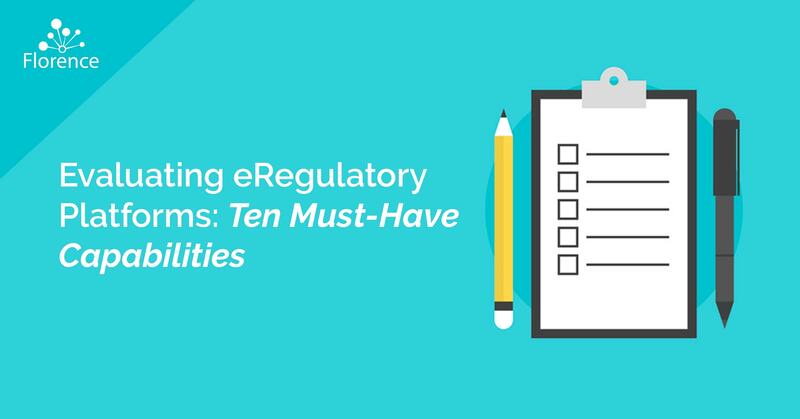 This checklist guide walks you through all of the questions you should ask eRegulatory vendors, as well as capabilities to look for when evaluating solutions. If you have questions about eRegulatory for Clinical Trials or would like a demo of Florence eBinders let us know!